Portrait of General Sir Charles Huxtable as the Colonel Commandant of The Ulster Defence Regiment. Charles Richard Huxtable was born in London on 22 July 1931 and died aged 87 on 26 November 2018. He was educated at Wellington College and then the Royal Military Academy Sandhurst before being commissioned into The Duke of Wellington's Regiment (DWR) on 8 February 1952. His early regimental service saw him, at the age of 21, on operational service with 1 DWR in the latter stages of the Korean War. Command of his 1 DWR rifle company included a United Nations Cyprus tour from May - November 1967 where he was responsible, in the Limasool Zone, for peacekeeping in the difficult district of Kophinou with its agressive Turkish Cypriot fighters confronting their Greek Cypriot opposition in the village of Agios Theodoros. 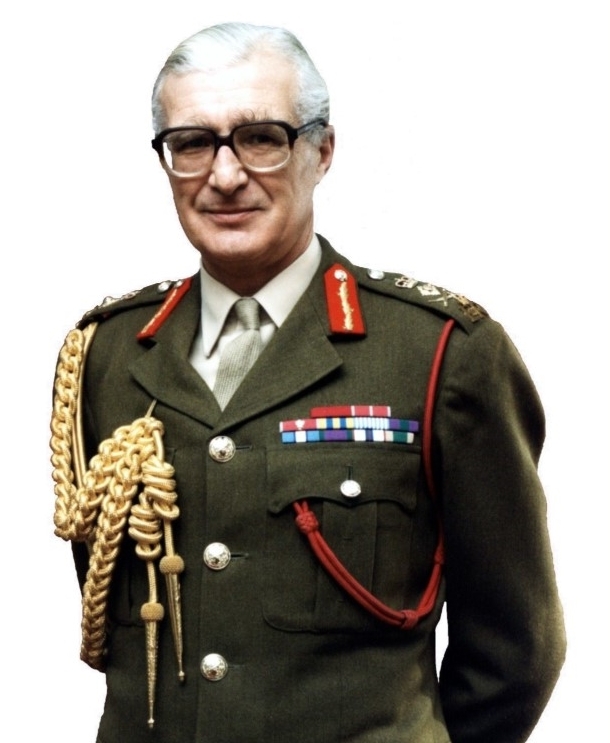 After a period as an instructor at the Army Staff College, he assumed command of 1 DWR In Hong Kong in 1970 before the battalion moved to Catterick, England from where it was deployed on Operation BANNER to Belfast and South Armagh in 1971 and 1972. On promotion to Colonel, he was posted into a Ministry of Defence (MOD) department where his appointment was responsible for operational policy in Northern Ireland. As a Brigadier on loan service to the Sultan of Oman's Armed Forces, he commanded the Dhofar Brigade In Southern Oman from 1976-78, a period that covered the gradual transition from the 'official' end of the Dhofar War to one of recovery and civil development. During his first year, while on a visit to jebel positions, he survived a helicopter accident when, despite a power malfunction with the tail rotor, the aircraft landed safely in a wadi. Returning to the UK, he was appointed Deputy Military Secretary in 1979 and then Commander Land Forces in Northern Ireland in 1980, Director of Army Staff Duties in 1982, and Commander of Training Establishments in 1983. He went on to be Quartermaster General in 1986 and Commander in Chief Land Forces in 1988, the year he handed over the honorary appointment as Colonel Commandant The King's Division. General Sir Charles retired from active appointments on 3 December 1990. He was Colonel The Duke of Wellington's Regiment from 1982 to 1990, when he was also appointed as Aide-de-Camp General to HM The Queen in 1988, and was the last Colonel Commandant of The Ulster Defence Regiment from 1991 until 1992. 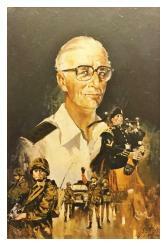 When The Ulster Defence Regiment merged with The Royal Irish Rangers to form The Royal Irish Regiment, he then served as the first Colonel The Royal Irish Regiment from 1 July 1992 to 1 July 1996. In retirement he served in various appointments including as a member of the Prime Minister's Advisory Committee on Business Appointments, the Chairman of the British Limbless Ex-Servicemen's Association and as a Vice Patron of the Army Rugby Union.